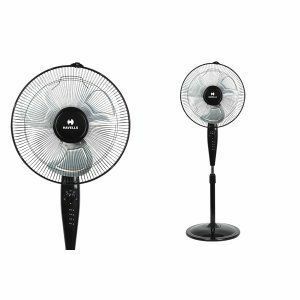 10 Havells pedestal fans are listed in this Havells pedestal fans price list at their best price online and offline in India. These have been sourced from sellers across major cities in India and are updated on a daily basis. Havells Pedestal Fans have gained immense popularity over the years for the ease of use they provide. These summer fans are not meant for one spot, but can easily be moved around from room to room and be connected to an available power source. You can wheel a Havells pedestal fan to the terrace, garage or out into the garden and create a pleasant atmosphere for yourself. Havells pedestal fans can be made to turn from side to side, allowing a wider area to be cooled. Users can also control the speed of the pedestal fan. A Havells pedestal fan requires no installation effort as they are supported on a long neck that stands on a wheeled base that enables it to be so portable. Havells pedestal fans are also user-friendly, affordable and last years before they require maintenance or repair work. This Havells pedestal fans price list had its prices last reviewed on 21st April 2019.